Pierburg development engineers can now produce brand-new complex sample parts ready for testing on the test rig in only a few days—a process that once required six weeks! These parts are no longer cast, but instead are generatively constructed layer by layer out of atomised aluminium powder. The company has optimised the innovative Selective Laser Melting (SLM) process with its own know-how, thus increasing the efficiency of the entire development process. “When we put the first machine into operation in September 2013, we had to contend with several malfunctions,” remembers Dr Frank Junker, Head of Sample and Batch Production in Neuss. Numerous refinements were undertaken with the active support of the in-house mechanical engineering staff . In the meantime, two machines are now running a total of 5,000 hours per year, including weekends, automatically and without tools, administered by a qualified team with a command of the intricacies of the technology. A lot of know-how is put into both the machine technology and the actual production process. “The challenge,” explains Dr Junker, “lies in producing the component in the desired quality quickly and economically.” The quality—which here especially equates with the density—of the component critically depends on the grade of the raw construction material. Pierburg utilises pulverised aluminium without a binding agent. “Finding the right powder,” says Dr Junker, “takes real detective work.” Only a few manufacturers worldwide can atomise it to the required quality from a solid substance. This allows us to achieve a remarkably high density of up to 99.9%. 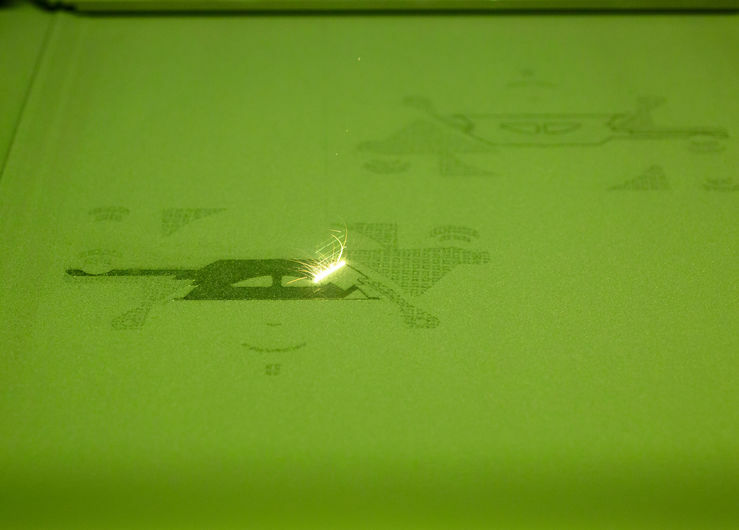 The extremely fine powder is deposited on the build platform of the SLM machine in thin layers only 50 micrometers thick, each half as thin as a sheet of paper, and exposed and fused with a laser beam in selected places.To compute the vectors of the laser, the CAD model of the component is subdivided into individual layers. After the material has solidified, the build platform descends incrementally by one layer thickness and the powder is then reapplied. This cycle is repeated until several thousand layers have been fused. After manually removing any supporting structures that may have been inserted, the component is then ready for immediate use. Greater efficiencies can be realised by adjusting the placement of the component within the machine and optimising the laser exposure times in relation to the supporting processes, e.g. the layering. In addition to the enormous reduction in manufacturing time from six weeks to two days, the SLM process offers additional advantages. One typical benefit of the process is the geometric freedom it affords, which opens up new possibilities, such as the production of hollow structures to reduce inertia. The laser is also excellent for fabricating 3-D conduits, such as for cooling lubricants, as well as for manufacturing undercuts, which are not producible with mould-based processes. Moreover, the high density ensures that the mechanical characteristics largely correspond to the base material. “The SLM process,” says Dr Junker, “is a success story for us. With our know-how, we are pioneers in a technology that is actually still in its infancy. 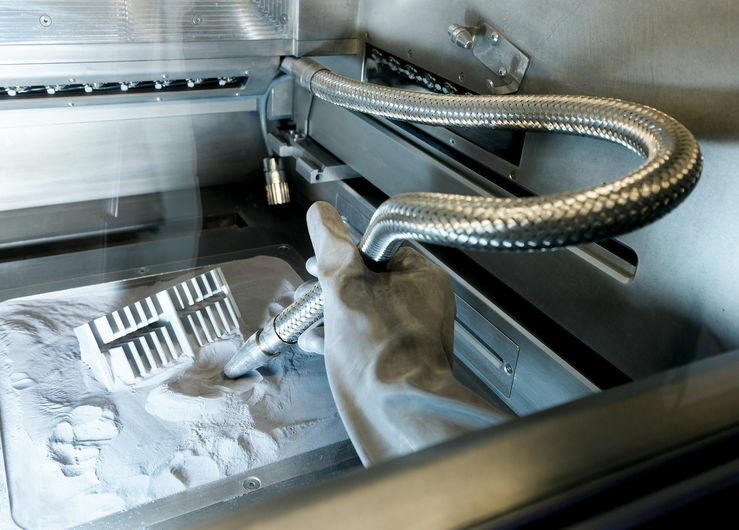 This has advanced the production of complex sample parts and, as a consequence, promoted the entire development process.” It provides similar benefits for other Group companies, which also commission Pierburg to produce sample parts on the SLM machines. Update: Once located within Pierburg's Sample and Batch Production in Neuss, the Rheinmetall Automotive startup Solidteq has been founded. For more information, head to www.solidteq.com.